On the Home tab, select Line and Paragraph Spacing, and then choose Line Spacing Options. 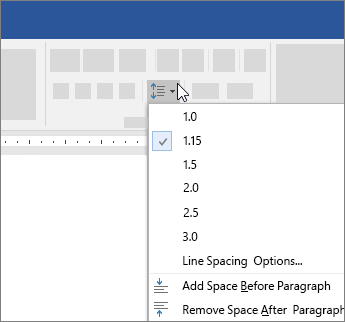 In the Paragraph dialog box under Spacing, choose an option in the Line spacing box. Adjust the Before and After settings if you want to change spacing between paragraphs. In the dialog box, choose All documents based on the Normal template, and click OK.
You can change the line spacing, but the next time you create a new document, Word Online reverts back to 1.15 line spacing.